Who doesn’t love “The Little Mermaid”? It’s the movie credited with kicking off the Disney animation renaissance of the late ‘80s/early ‘90s. 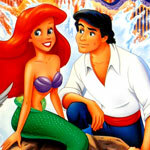 Its songs ranging from “Under the Sea” to “Kiss the Girl” totally rock. And, it made it socially acceptable for Disney princesses to wear two pieces (well, technically a one-piece and a tail…either way, it paved the way for Princess Jasmine’s ensemble which I am thankful for). But, there’s always been one thing that has bothered me. How the hell big is Sebastian the crab? In this scene, right before kicking off the show-stopping “Under the Sea,” we see that our favorite crustacean music director has a head that’s about half as tall as Ariel’s. However, later on during the delightful “Les Poissons” number, we find that Sebastian is a teeny tiny morsel compared to the psychotic chef. So what’s the truth? Are we to believe that Ariel truly is a little mermaid? She doesn’t seem that little compared to handsome Prince Eric. Is Sebastian some kind of magical crab that can change sizes at will? Does he shrivel up when he’s about to be eaten? Doubtful. Because that’s the exact opposite of what most wild animals do when confronted with danger. Most will puff up to scare off their predators. Freaky, isn’t it? 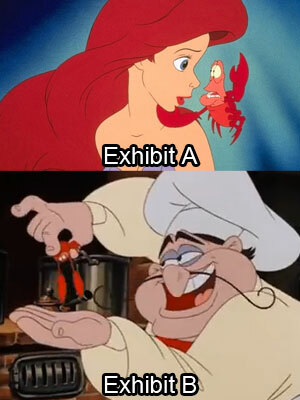 The chef could squash Ariel’s head like a grape with one hand. Which, considering how much joy he takes in butchering seafood is the most disturbing thing of all. This entry was posted on July 21, 2014 at 12:20 pm and is filed under Movies Whatnot. You can follow any responses to this entry through the RSS 2.0 feed. You can leave a response, or trackback from your own site.